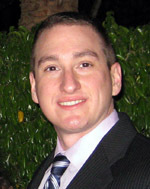 Dr. Michael T. Pettes joined the University of Connecticut in 2013 as an Assistant Professor in the Department of Mechanical Engineering. He earned his B.S. in Mechanical Engineering from Duke University in 2001, and his M.S. and Ph.D. in Mechanical Engineering from the University of Texas at Austin in 2007 and 2011, respectively. Prior to graduate work, he served as an infantry officer with the 1st Marine Division of the United States Marine Corps (2/1). Among his honors, he received the National Science Foundation Graduate Research Fellowship in 2005 and the Donald D. and Sybil B. Harrington Doctoral Fellowship at the University of Texas at Austin in 2006. His research focuses on the engineering of materials at the nanoscale and development of fundamental knowledge of transport phenomena in materials with applications for the management, conversion, and storage of thermal energy.